First Grade Math Units These First Grade Math units are research-based and designed specifically for first grade teachers and students. This is all you need to teach math for the whole year! Download the Preview for the Curriculum Map and a sample from First Grade Math Unit 2. This Bundle includes all ten units in the series. These First Grade Math units provide hands-on engaging lessons for you and your students. Each first grade math unit will provide four weeks of detailed Math instruction. Each day's lesson includes fluency practice, a new concept introduction, whole group exploration time, student application, and a regroup/share time. We believe in covering the standards so that your students have a deep understanding of the math concepts. Our goal is fluency and accuracy. These aren't merely a pack of worksheets they are actual research-based hands-on lessons and activities. *Using addition or subtraction to put together or take apart. *Counting to 120 starting at any number less than 120. This unit includes fun, hands-on work with addition, subtraction and a variety of word problems. *Determine, the unknown whole number in an addition and subtraction equation, relating three whole numbers. *Understand that the two digits of a two-digit number represent amounts of tens and ones. *Add two-digit numbers and a one-digit number, and adding a two-digit number and a multiple of 10, using concrete models or drawings. *Order 3 objects by length. Compare the lengths of two objects indirectly by using a third object. Review of all standards: Includes practice pages for each standard, help me practice cards and Math awards. View the preview for the Curriculum Map and a sample from First Grade Math Unit 2. 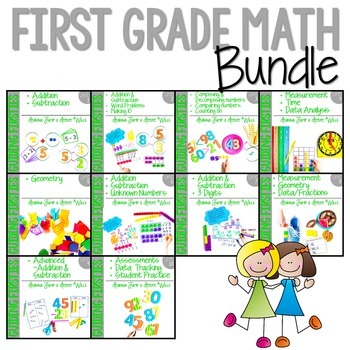 The First Grade Math units are also listed separately if you prefer to purchase them that way.